Image by waltarrrrr on Flickr. After holding a series of meetings in our shop late last year, the Figueroa For All (#fig4all) project has taken a hiatus due to the workload at the Flying Pigeon. Fortunately, that initial buzz we helped create got N. Figueroa St. included in the list of bike lane projects heading through a year long environmental clearance document the City of Los Angeles is creating. Once this massive document is created it will hopefully protect the actions the city takes if it is sued to stop laying down bike lanes. That is what the wizards in local government tell me. It would be a lot more helpful if they actually wore robes and funny hats too, but that might require a year long environmental clearance document – so it’ll have to wait. Our work publicizing the energy in this community for bike projects also helped our neighborhood get picked for a bike parking corral in front of Antigua Cultural Coffee House. 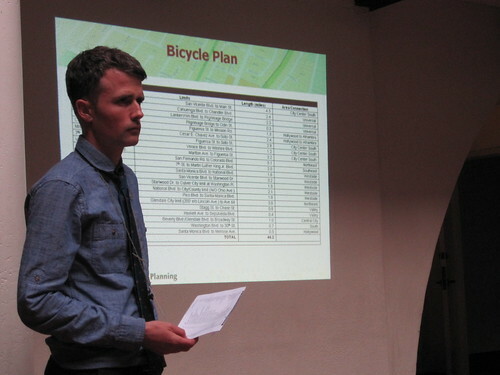 The City Planning Department held a scoping meeting on July 18, 2012 at the LA River Center to take input from “the community” on its implementation of the bike plan. I went, along with a room full of interested bike people, and some neighborhood advocates from other areas in LA. After talking with city staff and some representatives from the LACBC, it looks like the best option for N. Figueroa St. would be a “buffered bike lane” similar to the (infamous?) 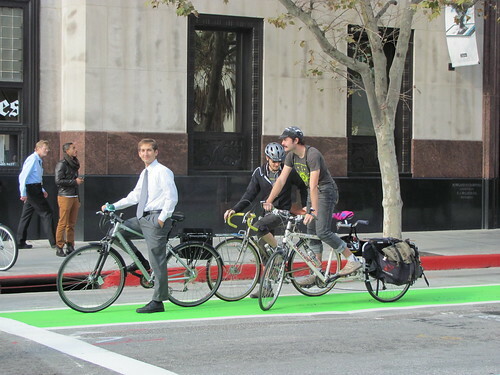 green buffered bike lane on Spring St. in Downtown LA. First, traffic volumes on N. Figueroa St. aren’t so high that removing a lane in each direction will back the whole boulevard up – it is more likely to create a little more delay at two freeway entrances, but otherwise leave car Level Of Service (LOS) mostly the same. Second, with a large buffered bike lane in each direction, crossing the street will be much safer for pedestrians – they will only have 2 lanes of 2,000 lbs. steel boxes to deal with instead of the current 4. Business in the old fashioned retail buildings on N. Figueroa St. will likely have their property values elevated, and have the prospects for a wider variety of businesses improved. Traffic volumes on N. Figueroa scrape the bottom (28,000 to 30,000 average daily trips) of its designed capacity (30,000 to 50,000 average daily trips) at two intersections: at York Blvd. and Avenue 26. The rest of the street has between 6,000 to 12,000 cars moving North, and about the same volume moving South. A single car lane can handle about 12,000 cars per day – so removing one of the two travel lanes in each direction on N. Figueora St. to install a buffered bike lane will not have too dramatic of an effect except at Avenue 26 and York Blvd. What is likely to happen is that the average speed of car travel will stay steady along the whole route at about 25 mph. Today that might be the average – but only because cars drive 40 mph in fast stretches and then queue up at lights for a while. Once car travel lanes have been reduced, all sorts of beneficial things happen on a busy walk-up retail street like N. Figueroa St. It is easier for pedestrians to cross, since the hazard from cars is reduced to two lanes plus a left turn lane. People who live in the area will have a more pleasant time shopping and running errands. It will be quieter, so casual conversation and the positive effects of talking to familiar faces will dominate life on the street. With a more pleasant atmosphere, business prospects for businesses outside of the liquor-store-discount-store-hair-salon-fast-food universe will have a better chance. Lifting business prospects means more vacant spaces rented, more business license permits, more sales taxes, more property taxes, more parking revenue, and generally more revenue for the city at the additional cost of paint for bike lanes. It was only on Tuesday, July 24, that I scanned and emailed a signed copy of the agreement between Antigua Cultural Coffee House and the City of Los Angeles. That Wednesday, a crew of interns arrived to pick up the hard copies. 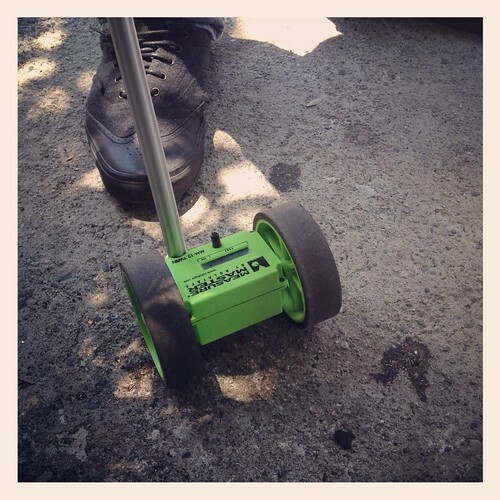 Then, on Thursday, an intern and an engineer arrived to measure out a bike parking corral out in front of our shop. Cafe de Leche on York Blvd. 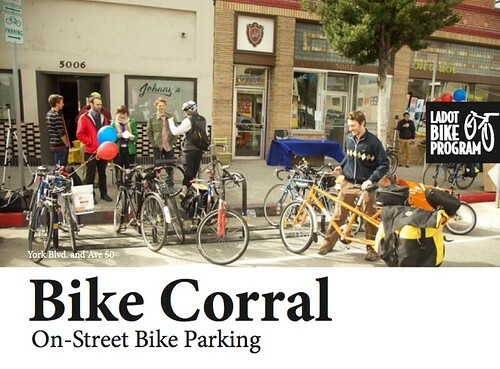 in Highland Park was the first cafe in Los Angeles history to have a bike parking corral installed. It looks like North East Los Angeles is leading the way again with the second bike parking corral in Los Angeles to be installed at the intersection of N. Figueroa St. and Loreto in Cypress Park. Talking with the engineer on site that day, I was told that Venice would receive a couple of corrals soon too. He assured me that we would get ours first (by, like, a day). Of course I forgot when exactly it would be going in – but it was soon. We’ll be sure to have a party to celebrate. So, despite Figueroa For All taking a 6 month break from meeting, good things have been working their way towards us! 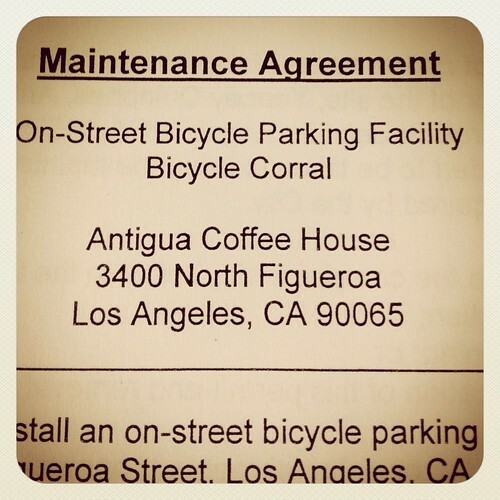 First, a buffered bike lane is on the menu for N. Figueroa St. Antigua Cultural Coffee House (our next door neighbor), will soon have LA’s first bike parking corral. What is next for #fig4all? 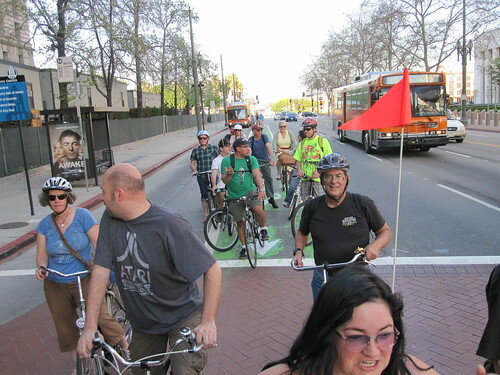 I plan on going to the ASNC and HHPNC meetings this month to invite community members to join us on a tour in September of the buffered bike lanes in Downtown LA. Camille Simon is working on a survey of shoppers in Highland Park and we’re partnering with a small private school in Flintridge to document life on N. Figueroa St. More details to follow, of course!